While Godolphin is not exactly having a banner year (for them), they did not have a bad weekend; Cocoa Beach’s upset of Ginger Punch in the Beldame may have garnered more headlines, but Tam Lin’s victory in the Kelso was equally interesting. The British-bred gelding seems to have taken to American turf racing quite well; he won the Scottish Monk earlier this year. However, we here at Superfecta HQ like him for another, rather more arcane reason: his name. In case you have not already read Francis James Child’s Popular English and Scottish Ballads (the newish Dover edition is only about five volumes), here’s a primer: Child collected and published traditional songs from the British Isles in the late 19th century. Each ballad was assigned a number (in not quite so formal a fashion as the later Aarne-Thompson or Aarne-Thompson-Uther classification systems for folktales, although Child did divide them into ‘types’) and Tam Lin and its variations fall under #39 (although it should be noted that it did appear in print before Child collected versions of the song). While the earliest recorded versions of the song (which is your typical boy imprisoned by fairies meets and impregnates girl who later rescues him from said fairies on Halloween story) are from the 18th century, it is likely much older and there are possible references to it as early as the 16th century. Since that time, according to Tyra Twomey in her extensive Tam Lin bibliography, it ‘has never knowingly ceased to be sung’ — and the sheer number of modern recordings bears that out (I am a fan of the version on The Waterson’s For Pence and Spicey Ale). Should you wish to know more about this Scottish ballad, it is well worth exploring Abigail Acland’s site devoted to Tam Lin. 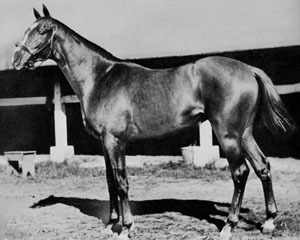 You may now be wondering what folksong has to do with horse racing (although you may also recall that we have a tendency to delve into such things here); well, it would seem there is currently a mini-trend of racehorses named after folksongs (rather like the Coolmore tradition of naming their horses after historical figures). Tam Lin is joined by King of Rome (recently third in Cologne, although still possible for the Arc) in this regard. Of course, the song is of much more recent vintage in King of Rome’s case, having only been composed in the 1980s and…oh, just check out the June Tabor or Half Man Half Biscuit versions! n.b. Apparently this is my 500th post. Who knew? I’m just hoping nobody takes Tam Bain’s Lum as a name before I get to breed my KY Derby/Arc/BC Classic winner. The LOC has a handy-dandy page on their website that lets you direct your email to the right department which is useful for us librarians and archivists who already know what department we need. We public librarians bow in awe before the wisdom and wizardry of the archivists!! Seems more a coincidence than a trend, unless somebody knows of a horse named, say, “Matty Groves” or “Hal-an-tow”. Re. “King of Rome”: Garnet Rogers’ version on “Small Victories” is also one to cherish — and the title track of that album is based on the true story of race-mare Two Bitter. See? “It all comes ’round again”, as it were….